Great video, Greg. We slot car users (digital and otherwise) sure are lucky to have Maurizio and his slot.it team around. Also, ​​​​​​does this mean all of those people who wouldn't use digital because there was no universal standard will now be using digital? Sorry, couldn't resist. Got kicked off during previous attempt to post question. Mr Flippant, this video was enlightening so thank you. Appears need a smart phone or tablet to use the chip, but what brands ? Do all lap counters still count ? At the very end there was a comment about running analog. Does that require a controller that also needs an app ? Are these chips available now and at what cost ? Lastly , suggest you post a pic or 2 of top and bottom of the toy you chipped, to actually see what was installed where. But, to answer your other questions. 1) Any that can run the nRF Toolbox app from Nordic Semiconductor. Search for it and download it, and you'll know if it works or not. No one can realistically make a list of compatible devices anymore. 2) Umm... yes? That's kind of the whole point. Did you watch the video? I literally described how laps were being counted every single time I switched to a new track. 3) I'm going to say no, because the controller doesn't need an app, per se. 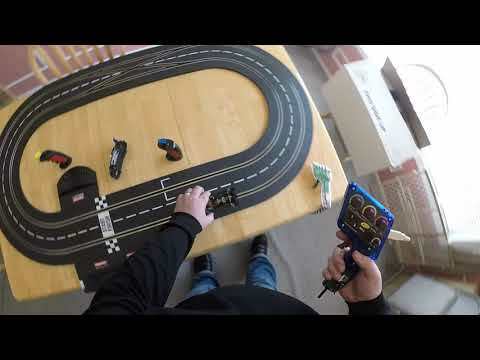 You need an oXigen controller to race the car on an analog track, because the chip doesn't support analog control, though it can take power from the analog track and function in oXigen mode. So, oXigen controller. You don't need an app for an oXigen controller. That said, if you don't have a SCP controller with an oXigen cartridge, then you can use the less expensive ARC Air/Pro controller. For that, you'll need the same app once. ONE TIME you will flash the oXigen firmware for that controller. From then on, it's an oXigen controller, just without all the fancy adjustments. Go to slot.it and read their manuals for your inevitable other questions regarding that. It's where I learned it all, so I 'm sure you can, too. 4) The chip does not appear to be available in the states just yet, but should be soon. It should be about the same as the current Type B chip, which is about $55. Suggest you watch the video some more, and read up on oXigen at slot.it again, assuming you have already read some of their docs and need a refresher, or to read more recent updates to their docs. The video was not meant to instruct people on how to install the chip, or even to provide complete details on how to program the chip. It was meant ONLY to demonstrate how it works, and that it does, in fact, work. I'm sorry for the confusion. I am not able to translate that in order to address it. Sorry Mr Flippant, but do not think can clarify that statement any better for you. Hey if you say it works, it must work, with or without that video. What hand controller are you using inb the video? I have no idea which controller you are referring to, so I'll answer with all possible answers. 1) At the very beginning, when I'm demonstrating that the track is an analog track, I'm using the SCP2 with high amp cartridge. This one is yellow in color. 2) After that and throughout to the end, whenever using the car in oXigen mode, I'm using the SCP1 with oXigen cartridge. The cartridge has been modified to get power from a Lithium-Ion RC battery that fits nicely into the handle. Truly 100% wireless. This one is blue. 3) After I reprogram the car with SSD firmware, I'm using a standard SSD controller from Scalextric. 4) After I reprogram the car with Carrera firmware, I'm using an OEM Carrera 2.5Ghz wireless controller (thumb type) for my slot.it Type C chipped car. I am also shown using a Digital Racing Solutions RamJet-X controller, which is wired, controlling the standard Carrera digital car. Very useful video. Well done.